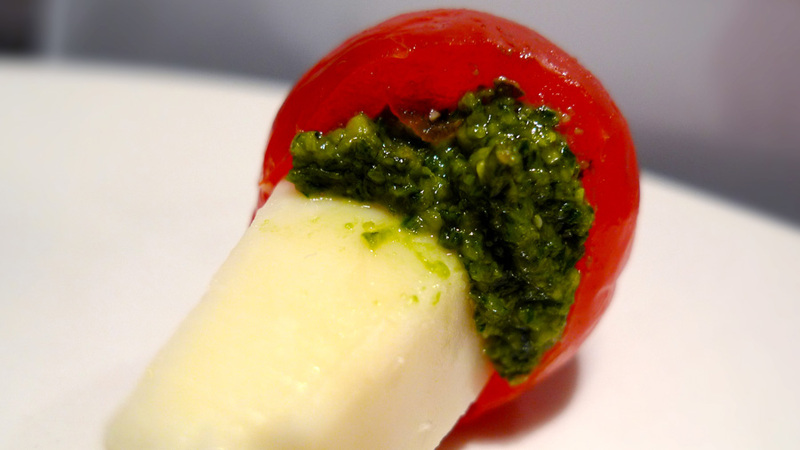 Cherry tomatoes with pesto | Two Guys In a Cucina! Cut the asiago cheese to make 24 pieces, rectangular shape. Set aside. Wash the cherry tomatoes and slice off the top. Carefully scoop out the seeds with a small spoon. Set aside. In a food processor combine the basil leaves, pin nuts, cheese and garlic. Add Sea salt and pepper for flavoring. Set aside. Stuff the cherry tomatoes with a piece of asiago cheese and use a small spoon to fill each cherry tomato with a little pesto.